Posted by Audrey Roy Greenfeld on April 25, 2017. We just released the early release (BETA) of the fourth edition of Two Scoops of Django. This supports the Django 1.11 Long Term Support (LTS) release, which will be maintained until at least April of 2020. In late May, we plan to release the print paperback version. Today you can purchase the early release PDF as well as pre-order the print edition by itself or as a bundle with the PDF. If you have any questions, please read the Two Scoops of Django 1.11 FAQ. Posted by Audrey Roy Greenfeld on June 07, 2015. We shipped all pre-ordered copies of Two Scoops of Django 1.8 on either Thursday, June 4 or Friday, June 5. For details on when your book will arrive, check your tracking number, which you should have received via email. On Wednesday, we received a huge delivery of books to our home. It was supposed to come on Friday, giving us the weekend to package our shipments. But it came two days early. We ended up staying up very late Wednesday and Thursday night to sign and package them. After signing each book, we shrinkwrapped and then packed it very carefully, to minimize the risk of damage in transit. On Saturday, June 7, we saw the first tweet about a book shipped directly from us! Posted by Audrey Roy Greenfeld on April 28, 2015. Welcome to the latest news about Two Scoops Press, PyDanny (Daniel Roy Greenfeld), and Audrey Roy Greenfeld (audreyr). The impossible has happened. We've decided to revise, update, and expand Two Scoops of Django for the Django 1.8 Long Term Support release. Today you can purchase the early release PDF. In mid to late May, we plan to release the print paperback version. Posted by Daniel Greenfeld on October 16, 2014. One of the most common components in Django that is replaced by alternatives is templates. The reason is either or both performance and design related. While there are numerous template bridge libraries to support the use of Jinja2, Mako, and other template languages in Django, there is not a standard API. This is unfortunate, because one of the virtues of using Django is that we can share our efforts across third-party libraries. Fortunately, Django core developer, Aymeric Augustin has started a crowdfunding campaign to create first-class support for third-party template engines in Django. We’re excited! Two Scoops Press is proud to be a gold sponsor for Django core developer Aymeric Augustin’s Multiple Template Engines for Django campaign on Indiegogo. Two Scoops of Django 1.6 India Edition Available! Posted by Audrey Roy on April 21, 2014. Within the next few weeks we hope to add Infibeam to the list of supported Indian retailers. The India Edition has special significance to us because my father is from India, and some of my family is still there. On my father's side, my grandfather was a civil engineer, and my grandmother was a mathematician. My grandmother passed away when I was very young, and my grandfather passed away a few years ago. I wish that they could have been around to see this. I grew up visiting my family in West Bengal often during the holidays. Posted by Daniel Greenfeld on April 03, 2014. We finally have a finalized proof of the forthcoming Two Scoops of Django 1.6 India Edition in our hands! The US edition, on the left, is 7.5x9.25 inches. The India edition, on the right, is sized A4, which is about 8.3x11.7 inches. The US edition is slightly thicker, but not dramatically so. The cover of the India Edition has more vibrant color (admittedly slightly rumpled thanks to the clumsy hands of the male co-author). The SD memory card and garlic clove are for scale. Posted by Daniel Greenfeld on March 04, 2014. Are you attending DjangoCon Europe? 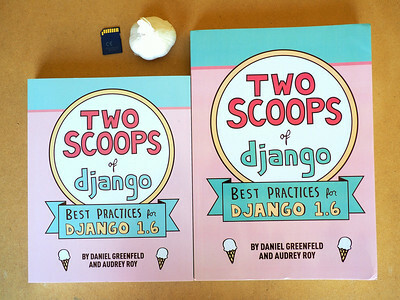 We have good news for you: DjangoCon Europe attendees can get a copy of Two Scoops of Django: Best Practices for Django 1.6 at the conference (pre-order required). Note that you must pre-order it via that page, and that sales will close on May 1, 2014, 2 weeks before DjangoCon Europe. This is to give us an exact count of how many books to ship to DjangoCon Europe. Unfortunately, we can't sign or individualize these copies as they'll be sent directly from the drop shipper.